Value of BMI between 18.5 and 25 is ideal but if the value is above 30 then you are an obese or overweight person and more vulnerable for many diseases like heart diseases, high cholesterol, diabetes type 2, arthritis, high blood pressure, stroke and many other dangerous diseases. Fat gets deposited in and around belly, in all living beings. Hence when a person becomes obese his/her stomach bulges out. (i)When a person consumes more calories than he/she burns then the excess calories get stored in the form of fat causing obesity. 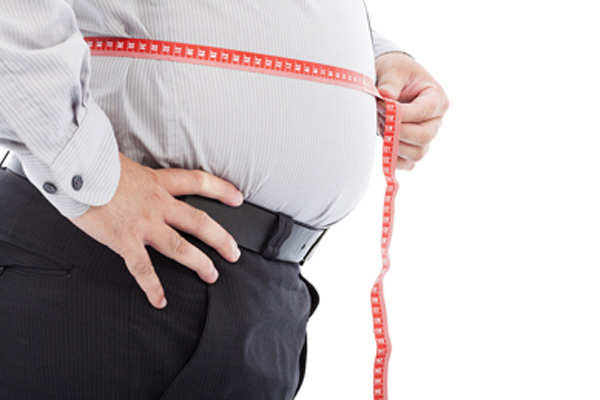 (ii)Some times few genetic factors also cause Obesity. Obesity tends to run in families. If parents are fat then the offspring also show a tendency to accumulate fat. Even the diet and lifestyle habits which are practiced in family also contribute to obesity. (ii)Some Psychological factors may also cause Obesity in which there is a tendency to over eat in response to negative emotions like boredom, sadness or anger. Over eating in such conditions leads to obesity. 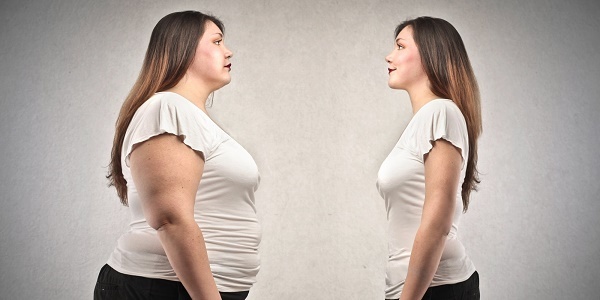 (iv)Medicines such as steroids and some antidepressants may cause weight gain and obesity. (v)Person's eating habits and the level of less physical activities also contribute for excess deposition of fat. When a person eats food containing more calories and perform less physical activities then the calories consumed are more than calories burnt. The excess amount calories are stored as fat. For our Body Fat Loss is more important than weight loss. Since fitness doesn't only mean losing fat but it also emphasizes on strengthening and building muscles. To lose fat and build muscles, try to consume diet rich in proteins but low in carbs and fats. Aerobic exercises coupled with weight training exercises are necessary not only to lose fat cells but also to tone and strengthen muscles. Try to get someone with whom you can do the Exercise workout together. This can be a friend or a relative or anybody you like. Fix a time with this person for workout. This gives a sense commitment and seriousness. A person who is moderately active needs daily, 33 calories per kg of body weight to maintain his weight. Reducing calories intake by 300 per day and increasing the physical activity to burn 200 calories per day results in weight loss of 400 Gms per week. Try not to use your car or bicycle for small distances like going to the shop etc, better walk instead. This helps a lot in reducing weight. Walking long distances and climbing stairs also proved very helpful in reducing Obesity(Fatness). Try to cut down on foods high in fats and sugar. Try to reduce both calories and the amount of fat and sugar eaten. Try to reduce sweets, sweetened drinks, large quantities of carbohydrates and oily food. Consuming wheat products than rice products also helps to reduce obesity. Lemon juice is also very beneficial to fight against obesity. Lemon juice improves digestion which is important and helps your body get the nutrients required to burn fat. Lemon juice helps remove toxins from your body that slow down your metabolism. To get the maximum benefits from lemon juice, take 1 tablespoon of lemon juice, 1 teaspoon of honey and mix in 1 glass of lukewarm water and have this drink early morning on an empty stomach. Apple cider vinegar is also considered very effective to breakdown fat cells and prevents the accumulation of body fat. To reduce obesity mix 1 tablespoon of unfiltered apple cider vinegar in a glass of water. Drink it daily in the morning and preferably before meals. Important Note: Daily drinking of only one tablespoon of apple cider vinegar along with a glass of water is sufficient. Do not exceed this amount because over consumption of apple cider vinegar may reduce your blood potassium levels over time and lower your bone mineral density. Women with risk of osteoporosis shouldn't drink apple cider vinegar before consulting a doctor. Apple Cider Vinegar may also interfere with blood-thinning medications, diuretics or insulin. Eating 10-12 fresh curry leaves daily in the morning works as an excellent home remedy to deal with obesity. In addition to fight against obesity, curry leaves helps to get fit body by burning unnecessary fats and cholesterol. The leafy green cabbage helps a lot to beat obesity by inhibiting the conversion of sugar and other carbohydrates into fat. In addition, cabbage is a good source of vitamin C, fiber, potassium, and many other nutrients but low in calories. To get the maximum weight loss benefits, try to make raw or boiled cabbage an integral part of your daily weight loss diet plan. Tea made from cinnamon and honey is also very helpful to burn your fat cells. Honey promotes fat metabolism while cinnamon prevents overeating by fighting insulin resistance and also reduces oxidative stress associated with metabolic syndrome. In addition, it doesn’t let sugar level get high in your body, there is lesser storage of fat. To reduce obesity take a cup of hot water and mix half teaspoon of cinnamon powder. Let it steep for half an hour and then mix 1 teaspoon of honey. Drink this in two parts. Drink the first half in the morning on an empty stomach, about half an hour before breakfast. Store the rest in the refrigerator and drink it at night before going to bed. Green tea has been shown excellent results to fight against obesity. According to recent studies, epigallocatechin-3-gallate (EGCG), a compound found in green tea, helps slow down weight gain by limiting fat absorption and increasing the body’s ability to use fat. To beat obesity try to drink 2-3 cups of green tea on a daily basis until you get the desired results. Oolong tea is an other natural fat burning tea that aids in weight loss by burning fat cells. In addition to caffeine and an antioxidant called epigallocatechin gallate (EGCG), oolong tea has this component, polymerized polyphenols which is responsible for burning fat in your body. Regular consumption of oolong tea will show you an amazing results within few days. Ginger tea is also very beneficial for weight loss. It aids in weight loss by improving digestion and by boosting metabolism. To make ginger tea at home take 1 cup of lukewarm water and mix with half tablespoon of ginger juice, half tablespoon of honey, and 1 teaspoon of lemon water. Stir them wall and drink this twice a day. The honey, ginger, and lemon juice all work together in harmony with their wholesome properties, making this an excellent drink against obesity.